1st Cole Thompson: Davi Millsaps raced our series a few years ago, and wherever Davi pointed his KTM, it went. He could cut down anywhere, anytime. Well, Cole and his KTM are doing the exact same thing. 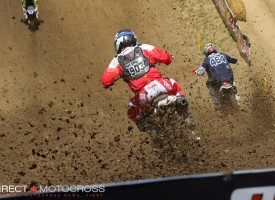 The track was nasty at times, but Cole was in complete control of the bike and the race. He looks so good, it’s scary at times. 2nd Cade Clason: Cade has been inactive since outdoors, so I expected a little rust. Turns out, I was wrong. A notoriously bad starter, Cade and his starts were on point (NB: As editor, it kills me to leave that colloquialism in here, but I will). Even when he didn’t get the start, he was still able to sneak in and make something of it. He looked really good leading Saturday night and should have had the win. I kind of feel like I should take some of the blame. You see, I usually provide Cade with a pack of Starburst, every weekend, but I completely dropped the ball… my bad. Cade added some muscle this off season and should be stronger later on in the motos this summer. I feel this will be the best Clason yet. 3rd Steve Mages: Steve is an AX specialist, and it showed. He’s very quick to adapt to the track, and on the gas instantly. This guy wants to ride outdoors really bad, and with his speed and fitness, I’m really shocked that nobody has given him a shot. He’s willing to ride anything, if anybody is actually reading my stuff?! 4th Matt Goerke: A bit of an off weekend for Goerke. He came into the season with an arm injury and really no time on the bike. He got better as the races went on, and will be very very hard to beat outdoors. It’s not often we see Matt not battling for wins, so I bet this pissed him off a bit and we see one of the fastest Goerkes yet come round 1 in Calgary. 5th Colton Facciotti: An off weekend for Colt. He hit the dirt a few times and also got bumped around a bit. He’s one of the best Canadians ever, so he will surely bounce back stronger for outdoors and keep fighting for that 100gs. 6th Tyler Medaglia: Tyler looked great, right from the first practice. Unfortunately, he hit the ground quite a few times both nights; some were solo diggers and others had help. He had the speed and intensity to win, but mistakes cost him. Like always, Tyler is still one of the biggest fan favourites and for good reason. 7th Keylan Meston: I had a good talk with Keylan Friday afternoon. He seems like he’s in a really good place with the Carlson Racing team. He looked pretty good at times, but he also hit the dirt dropping him back a few spots. 8th Dillan Epstein: I was expecting a breakout ride from Dillan this weekend, but, unfortunately, it just wasn’t there. He looked really good at times, but had some issues other times. I think he’s really going to shine for outdoors and won’t be surprised when we have both OTSFF Rockstar Yamahas on the podium together a few times. 9th Kyle Keast: Solid ride for Kyle against guys with way more indoor experience. But he showed his strength and stubbornness when his bike let go and he pushed it around a super-tacky, rutted track to cross the finish line. Very impressive strength by the Dozer. 10th Davey Fraser: Kind of a rough weekend for Davey. He just couldn’t seem to get going. I like him on the 450 and I’m looking forward to seeing him outdoors. Even though the results weren’t there, the smile still was. Biggest Stud: Cole Thompson is my Stud. He was very dominant from the get go. Biggest Dud: Once again, where were all the Ontario pros? Biggest Surprise: No disrespect, but Cade Clason surprised me with his starts and intensity. The #9 looked very good all weekend long, and will do big things outdoors. MC’s ‘G’d Up from the Feet Up’ Award: Dillan Epstein and his Alpinestar Tech 10’s, Fly kit, Bell Rockstar Moto 9 helmet and EKS goggles looked top shelf to me. Dillan Epstein gets the 450 ‘G’d Up from the Feet Up’ award. Thanks for reading. See you in Calgary.